The recipient of these gifts is your life mate, your wife, your soul mate and your life-long companion. Every year is special, even if it isn't considered to be a mile-stone anniversary. Plan ahead and your gift, when it comes from your heart, no matter what it is, will make your anniversary special, no matter what year you are celebrating. The day you eagerly said "I do! Each wedding anniversary helps you remember one of the most important and special moments of your life - the day you eagerly said: "I do!" As you think back to that precious day, consider surprising your husband or wife by having an anniversary gift basket delivered to their home or office. 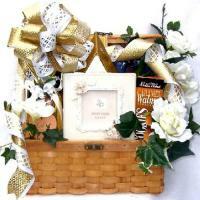 At Adorable Gift Baskets, you'll find numerous anniversary gift baskets with themes for any husband or wife. Adorable Gift Baskets delivers anniversary baskets filled with candies, chocolates, pampering spa gifts, fresh fruit, and even mouth-watering gourmet foods. An anniversary should be a time when you pamper that special someone with the items or foods they enjoy. A wife usually enjoy a luxury spa bath and body gift basket filled with aromatherapy products, candles, and relaxing music. Pamper your wife on your anniversary with a spa anniversary gift basket delivered that's filled with her favorite scents, and include a romantic message for your greeting card to share your admiration for her. 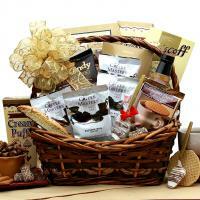 Satisfy the stomach and win his heart all over again with a gourmet food gift basket from Adorable Gift Baskets. He'll love our food baskets stuffed with treats such as smoked salmon, sausage, cheese spreads, popcorn, pretzels, cookies, chocolates, and more. Or, greet him at work on your anniversary morning with one of our coffee gift baskets. These might include special roast coffee blends, a coffee mug, cookies, chocolates, tea, and other goodies. 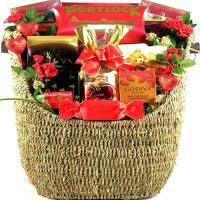 And, of course, we offer a huge variety of sports gift baskets such as golf, fishing, hunting, football and more. Get intimate on your anniversary night with our Romantic Game for Lovers. This features delicious body frosting, soft brushes, a game board with spinners, and ìTruth, Dare or Chocolateî game cards. 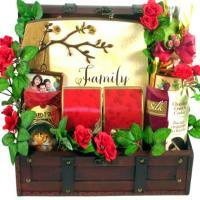 You can also opt for our anniversary gift baskets delivered in fancy gift boxes that can be displayed as keepsakes. Celebrate your anniversary with hand-delivered roses, our Romantic Bedside gift box, a cookie basket, or a teddy bear basket. Adorable Gift Baskets makes it easy and affordable to say "I adore you!" 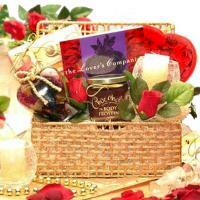 An anniversary gift basket delivered to your spouse will reaffirm your love again and again!